Progression Obsession: Should I Say Something? Kelsi, in your opinion should a person say something to an individual who is obviously severely underweight? Some expression of concern? I’m not talking about a perfect stranger, but maybe a coworker, or a not-too-close friend. You’ve written a lot about denial; are any comments useful or just alienating? And, if so, what approach would you recommend? Yesterday I received this question on my previous post. As I began typing a response, it dawned on me how many possible answers there are to this question. Depending on the person or situation an individual may be highly offended or feel relieved if questioned about their weight. "I might not directly say something, but vaguely show interest in them, reach out to ask how they are doing often and be genuine about it." "Show concern without mentioning weight—that puts them in defense." "I think I would start with trying to make sure it wasn't a health problem first. Maybe if the person was ill they would feel self conscious about having their weight pointed out to them. It should be clear that the person was coming from a place of caring and compassion and not criticism." "I don’t think it’s ever okay to bring someone’s body size up in conversation, even if it’s out of genuine and loving concern." In my opinion, I actually think it is best to say something. The individual most likely will not be accepting, due to that denial, but completely ignoring the problem is not the answer either. Even if the person does not seem to be listening, you would still be providing a level of comfort by reaching out. If the person does eventually decide they want to get help, then at least they know you are willing to listen. However, with the input from the comments above, I would be cautious about directly mentioning their weight. The most frustrating part of recovery from an eating disorder is every case is incredibly different. What works for one person generally will not work for another. 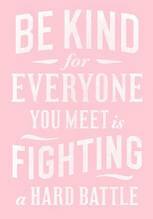 While some people might be offended by your concern, others (myself included) will be grateful that someone took the time to reach out. For years I felt as though I was not sick enough because no one said anything. In my mind, my problems were constantly being swept under the rug and it was hurtful. Denial is absolutely an issue to be considered here. If someone had expressed concern towards me, for example, I would have pretended everything was going well and assured them I was fine, but deep down would have felt angry with myself for letting it get that bad. There is also a good chance the person in question is already aware of their issues and would feel alienated when the topic is brought up. There are many sides to this question, but I think the bottom line is: expressing genuine concern without the mention of weight might be the way to go. Making sure the person is actually sick and not just naturally thin is a good idea, too. 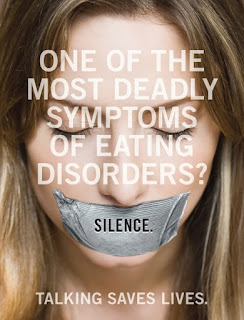 In my opinion, ignoring the problem only creates greater stigma around eating disorders. Although the individual may not be accepting in the moment, deep down they will appreciate knowing someone does care. Not sure if this answered your question or not, Aunt Judy, but hopefully it helped you understand the eating disordered thought process. There might not be a perfect answer here due to the individual nature of eating disorders, but expressing a little kindness never hurts. 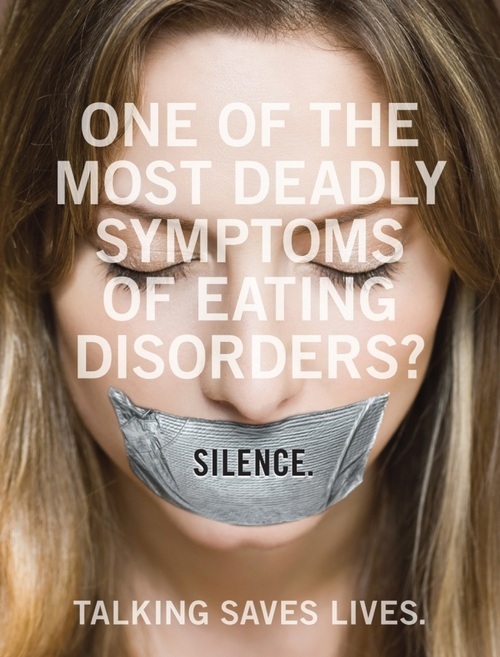 In my opinion, anytime someone speaks up against eating disorders or shows support, we are taking a step forward. this is such a tough question. I have both sides of the spectrum, one where I lost a friendship because they were in the denial and two because I back off in fearing that loss of friendship. I never know, it is hard because I feel like I a sixth sense when it comes to ed's (does that make sense? like I know if it really is something or just a normal mindset) so I want to reach out but never know exactly when or where is the best to do it. It definitely makes sense. It's almost like we have a heightened awareness of eating disorders because we have been there. I still don't know if there is a right or wrong answer. Ultimately I think it comes down to the individual situation. Thanks Kelsi, for your very thoughtful reply. I assumed there was no easy answer, but complete silence in the face of obvious issues seems to be so strange and uncaring in a society that supposedly values honesty and openness. A concern might be a person's weight, but it could be someone who appears abnormally sad, stressed, fatigued, ill, or worse yet..bruises or other signs of physical abuse. My sister once said she tries to judge her speech with 2 questions: Is it necessary? and.. Is it kind? Great criteria, but the answers might be different for the speaker and the receiver. Tough stuff but worth contemplating. Absolutely. I really like the "Is it necessary?" and "Is it kind" idea. Never an easy topic. Thanks for asking such a great question. I'm sure you're not the only one who was unsure of what to do in these situations. I thought to myself, "what an excellent question and topic" and then i kept reading, only to discover that my mom asked the question! It's another excellent post, Kels. I agree with this response: "I don’t think it’s ever okay to bring someone’s body size up in conversation, even if it’s out of genuine and loving concern." BUT I would add the key word "publicly." Personally, I think it's sometimes very effective to raise the topic in a genuine and caring way, but only in a one-on-one setting. Public commentary can be offensive and embarrassing...it may put the person in an uncomfortable spotlight. I've wondered why people find it okay to mention weight in a public setting when someone is noticeably thin, but yet no one would dare raise the topic of weight in a public setting if someone was noticeably overweight. Great post Kels! Personally, I like the idea of approaching the subject as more of an overall check in..."is everything okay?" "how are you doing?"... as opposed to coming out and saying something about weight. For me personally, there were times when I was sick that people commenting on my appearance and weight just further fed my eating disorder in my head... but everyone is different. I agree that it is a hard question to answer and is different for every person, but I also think that if nothing is said than they could continue in denial or feel like they weren't "sick enough" because maybe no one noticed, when in reality it's just that no one wanted to say anything for fear of saying the wrong thing. Right, exactly. It's like either way you can get yourself into trouble, which is why I still think saying something is better than nothing. Maybe saying the wrong thing is better than nothing at all? I don't know if we will ever find the perfect answer to this one.